Speedy the cheeky house bunny: Speedy's Blog Blast For Peace! DONA NOBIS PACEM "Grant Us Peace"
I love your Peace post Speedy!!! Here's to Peace for all species, today and every single day! Nice Peace picture and message, Speedy! Peace to all our friends! Speedy what a wise bunny you are! Sir Speedy, what a wonderful blog you have today. The sentiment is so dear and so are you. In Austin, I often see people wearing T-shirts that say, "There is no way to peace. Peace is the way." I know people here who finish the Hail Mary with the words, "Holy Mary, Mother of God, pray for us sinners and for those who do not sin, now, in our hours of need, and at the hour of our deaths." The second part about "those who do not sin" is especially for cheeky bunnies and the livingness of this world. You know carrots and trees and stuff like that, too. But a little more caring about each other goes a long way! Sir Speedy, something tells me I am not going to be allowed to forget my "naughty bunny" comment anytime soon. If I could just rephrase slightly... If there are any naughty bunnies out there, no one has ever gotten any photographic proof, and the whole notion of a naughty bunny is generally believed to have been a wild tale begun by some irresponsible person in the blogosphere. The expression "naughty bunny" is itself an oxymoron. Further more bunnies are really The Lord's own little angels. However, if it will heal any little rift, I will continue to rethink this prayer so that it specifically includes the possibility of the hypothetical "naughty bunny". Do you think I should include anything for hypothetical targets of hypothetical "bunny naughtiness ?" all is forgiven*Speedy reaches up on tip toes to give bunny kisses on the tip of your nose and jumps away giggling*hehehe,to have peace you have to have forgiveness! That's my Sir Speedy! He knows what's what, and I think I have just been knighted. It tingles all over and leaves a warm glow. Peace be with you and yours, Little Buddy. Hehehe you are fun too! 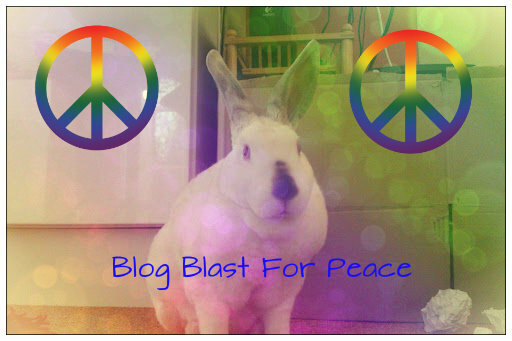 I've seen peace-blogging cats and dogs, and goats and mice...you are the first peace-blogging bunny I've seen! :-) good to meet you! Welcome to the peace bloggers, Speedy! You are a beautiful peace lovin' bunny. We are so glad to have you with us.